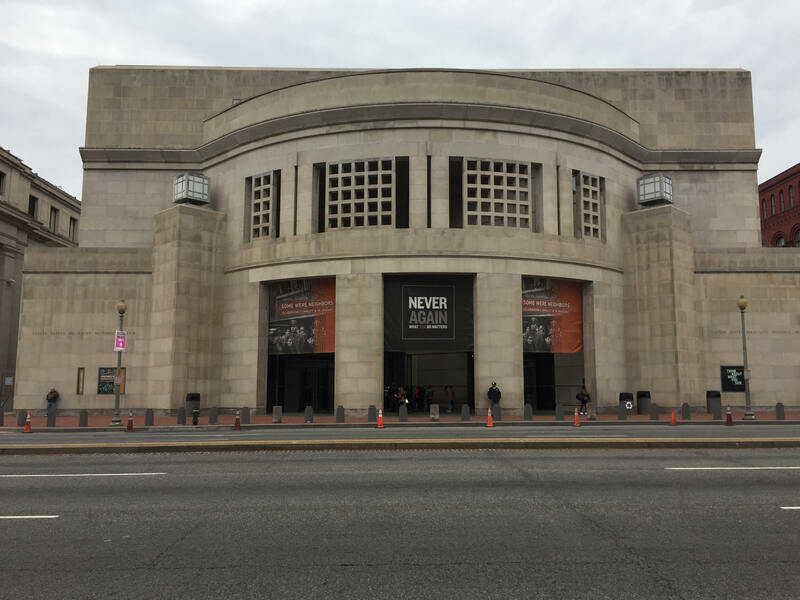 After warming up and getting a snack at the cafe next door to the Bureau of Engraving and Printing, we went to the Holocaust Museum nearby. This was Lauren’s senior trip, so we let her choose most of the stops we made, and this is one she wanted to see. I must admit that I did not. I have a good imagination and have done a substantial amount of reading on WWII and the holocaust. So much so, that I did not feel I needed this trip. I’m too sensitive! But, I roused my courage and went in. We were pleased that Mitch’s knife passed security here, so that was less thing to worry about. I was also happy that they had a coat check available! It was cold outside, but muggy inside the museum. It was nice to check my coat, as well as the kids’ coats, to free up my hands. The directions were, “How did Daniel’s story make you feel? 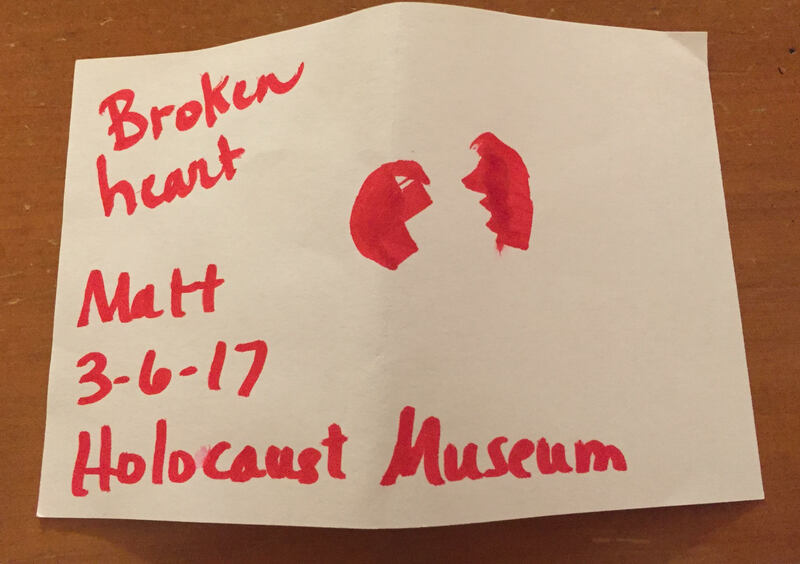 Draw or write it.” Matt drew the broken heart, then I labeled it and dated it. We could have left it there in a special display, but I wanted to keep it. The girls wrote something that they wanted to leave. From here, we took elevators up to the top floor and worked our way downstairs. As we got on the elevator, we were told to take an “Identification Card”, which told us the fate of one of the prisoners. If you were a woman, you got a female, men got a male card. I got the ID of an older woman who disappeared. She probably died at the hand of the Nazis, but no one ever found out for sure. Matthew got a 12-year-old boy who was gassed. I didn’t tell him. The top floor tells how Hitler came into power. There is a 14-minute film telling how he worked his way up from a nobody to Chancellor of Germany. It is disturbing and sad. There is a large photo, taller than a person, of two Nazi guards walking with a German shepherd dog. One of them looked very young. It was hard to believe that such normal looking people could be capable of such cruelty and hate. The museum was filled with people in this section, so many that I felt claustrophobic. I was also worried about losing the children in the crowd. The stuffy, muggy feeling of the museum was more apparent there as well. I wasn’t sure if the room was really that humid or if it was my mind making me feel that way because of the depression and grief I was feeling. Anyway, due to the crowd, we shuffled our way out without seeing many displays. I had to sort of tune out a lot of the displays. Some of them were maps, which don’t interest me very much, and some were equipment of the time. I moved passed those pretty quickly. There was a display that showed that the Nazis not only targeted Jews but also Jehovah’s Witnesses and homosexuals. The longer I walked the halls, the more oppressed I felt. As I said, I am sensitive. Getting out of there became my number one goal. And as I felt this longing, I felt an even greater sympathy for the Jews who only wanted to get out, to go home, but could not. By God’s grace, that could have been I! I took only a few photos, because again, how do you treat such a place? It seemed to be more than a tour that you gawk at, it felt like one long funeral. I wouldn’t take photos at a funeral. Yet, it was a tour. 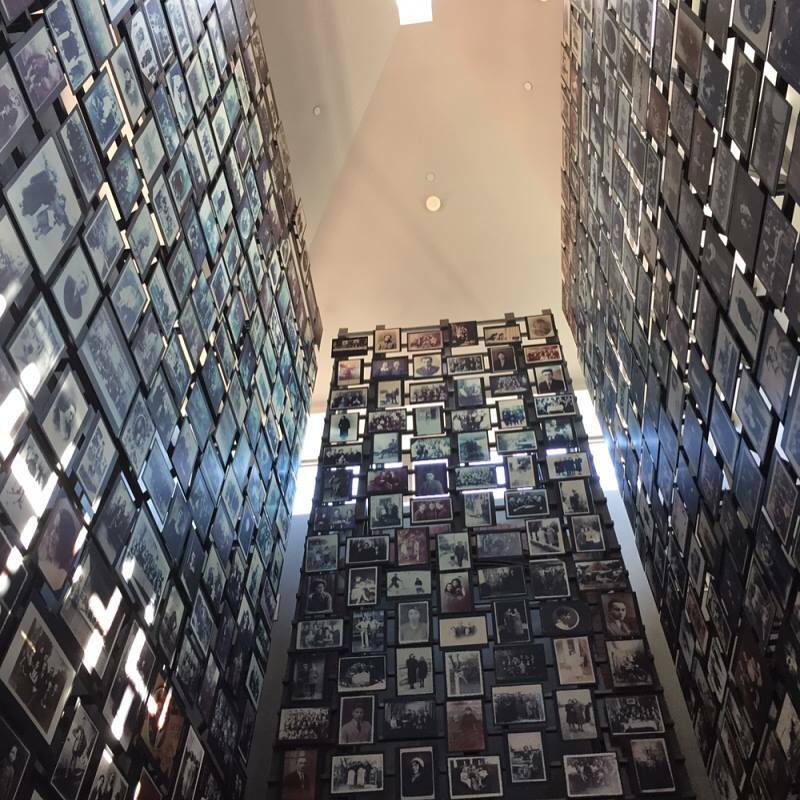 They want people to walk through, to see the exhibits, and even to capture the memory of them. I felt that I could take a few tasteful photos to share. These photographs are photos taken from Jewish photographers’ studios after the owners were carried off to concentration camps. The photos are of Jews. There are no names, just faces. There are portraits of families, happy and comfortable; women, smiling with anticipation of a bright future; men dapper dressed, ready to face the world. The photos capture a moment in time, a happy moment before the Third Reich ripped into the lives of so many innocent people. The photos are three-stories high in this section. The warmth and humidity of the room mingled with the smell of the ancient, worn leather made me feel quite nauseated. A headache formed above my eyes. I could not stand here long. Next door to this exhibit, was the same type of setup that you see in the photo above, only it was piles of human hair taken from the Jews. I could not pause, I could not even hesitate, or I would have been physically ill.
We saw a replica of a boxcar that transported the Jews to camps. We saw a large diorama-style carving of the process by which the Jews were killed. We saw a gate that said in German, “work will make you free”, which once stood at the entrance of a labor camp. What a lie it was! They worked them until they died, the only freedom they would have would be through death. It is Deuteronomy 30:19 “I call heaven and earth to record this day against you, that I have set before you life and death, blessing and cursing: therefore choose life, that both thou and thy seed may live:” My husband commented that it is one of the strongest condemnations of Israel in the Bible. Israel had a conditional covenant, an “if-then” covenant. If they followed God, then blessings came; if not, then cursing. Surely one can make the connection that the holocaust was God’s judgment upon His wayward people? It struck me as an odd choice to have in this museum. Truly God has blinded some people to the truth (John 12:40). This room was lovely and cool, a refreshing break in an otherwise bleak tour. As we were getting close to the end, I passed by the greatest part of the whole place: The Wall of Rescuers! I have read Corrie ten Boom’s book, The Hiding Place, and eagerly searched for her name, and guess what? I found it! 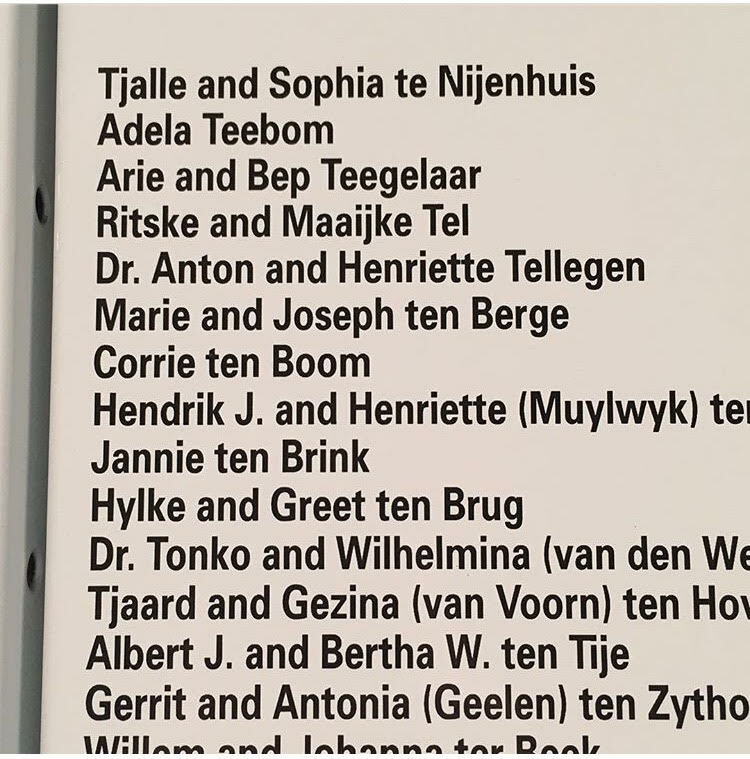 There were thousands of names listed by country. People of all walks of life who sacrificed their own lives and comfort to spare the lives of others. What heroes! I couldn’t help but let a few tears fall in their honor. I also gave silent thanks to God for His mercy to me. He sent Christ to be my Rescuer! I was doomed for Hell, like all of mankind, but He stooped down to save me! I’m so undeserving, so unworthy, so vile and wicked, yet, He loves me anyway. This was the highlight of the museum. Now that I had let the tears begin, there was no stopping them, especially at the last exhibit. It was a video of survivors sharing how they managed to live: a kind German female guard in a concentration camp, tying the shoes of a Jewish teen and physically carrying her feverish body out of her cell to avoid her being taken away and killed; a mother, taking her grandson from her daughter with an excuse and telling the guards that the boy was her son, because she knew that her daughter and grandson would die if she didn’t intervene. Her final words to her other daughter were “Look after your sister, tell her I did it for her” (once she realized her son had been killed with her mother). And there were more, many, many more. I quickly went through the five or six kleenexes that I had tucked in my purse, so with a stuffy nose and mascara trailing beneath my eyes, I implored my family to leave. They acquiesced. A few of them were crying, too. As we went to retrieve our coats from the coat check, we noticed a desk where a holocaust survivor was sitting, available to answer questions or discuss the holocaust with any who wanted to do so. I would have loved to stop to speak to her, but what could I say? I was barely able to form words on the subject anymore. My head was pounding by the time we left the museum. As soon as I stepped outdoors, I inhaled the crisp, chilly air, felt the breeze against my cheeks, and thanked God for America. We then found a food truck to grab a drink for me so I could take some medicine for my head. We decided to eat lunch there, too, since this was one item on Lauren’s bucket list. We all got a hot dog or a pretzel and a drink. We sat on a bench by the street and enjoyed our meal. Matthew even got to feed a few crumbs to these tiny birds that came very close. They must be used to getting fed by strangers. 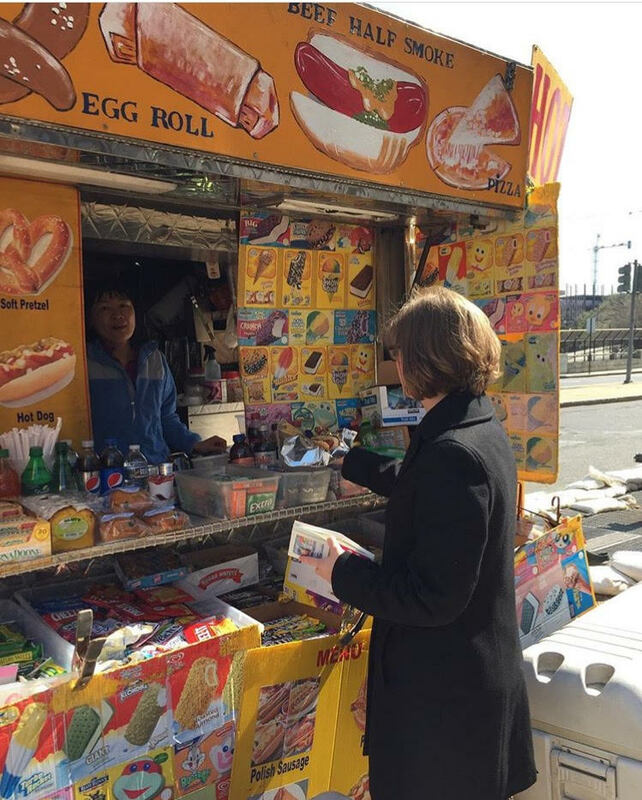 She can now cross off “eat at a food truck” from her list! The next stop would be Smithsonian National Air and Space Museum. Join me next week for another installment of our D.C. adventure! Thank you for sharing your beautiful story of this extraordinary place! An addition to my bucket list. 😉 It reminded me of the War Museum in London. 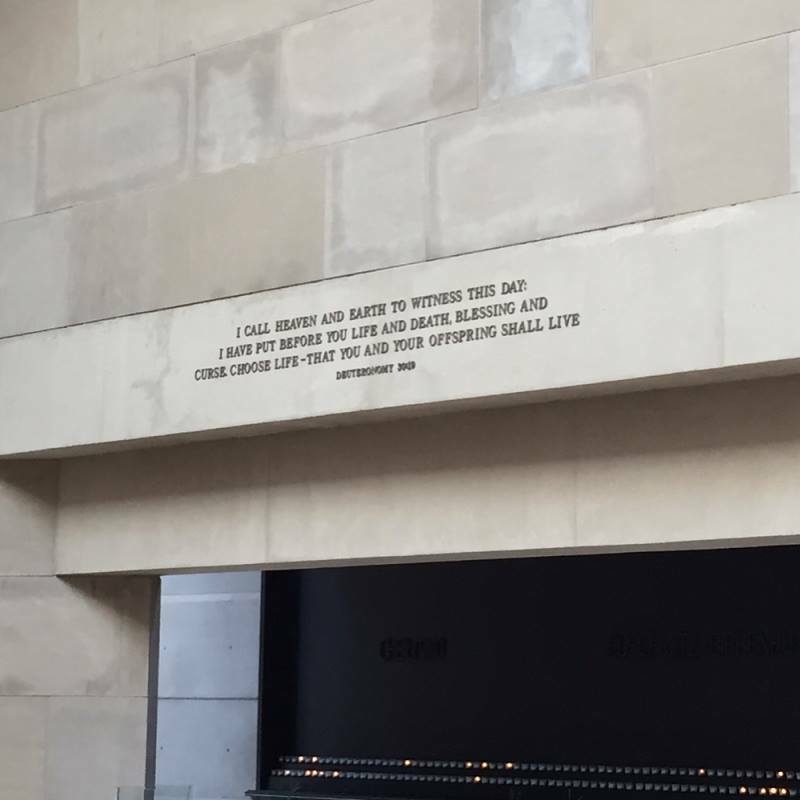 I love museums that tell a story of the 1st and 2nd World War . . . always a poignant reminder of sin, of man’s corrupt nature, and at the same time, a remarkable story of a few people who do heroic acts of saving the lives of others. Have a happy easter weekend. Oh, Elna, I will never go again. Perhaps you are not as sensitive as I am, otherwise, brace yourself. It’s hard. Thanks for the comment. 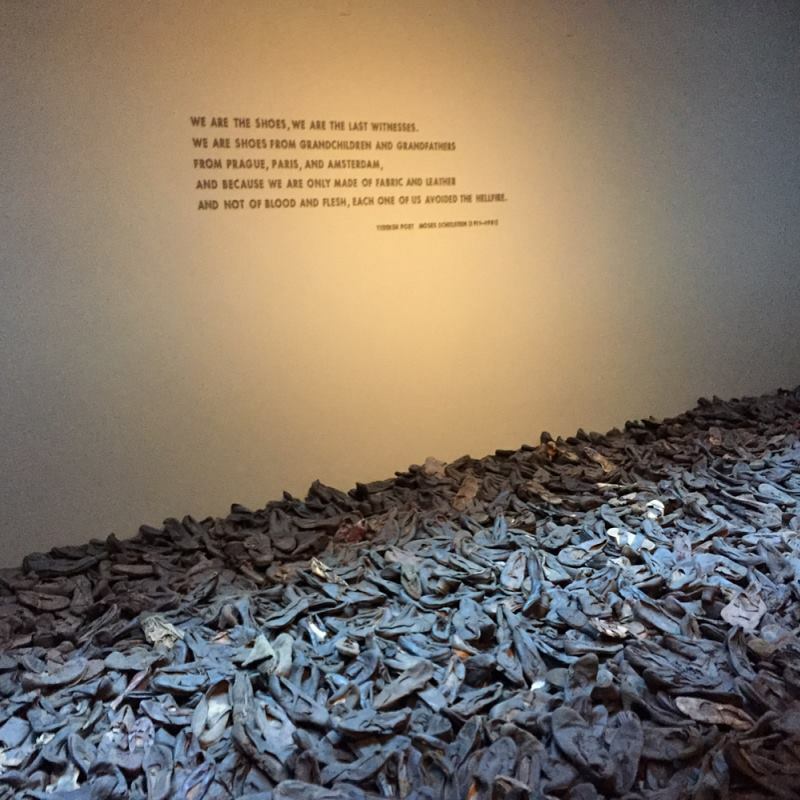 Always make me cry the first time I visit a war memorial museum especially when reading the heart-breaking stories, seeing the old shoes, gold fragments collected from the teeth of the Jewish killed in the Holocaust and all of that…. 😦 but the second and succeeding visits, I try not to shed tears because once I start crying I couldn’t stop. LOL! 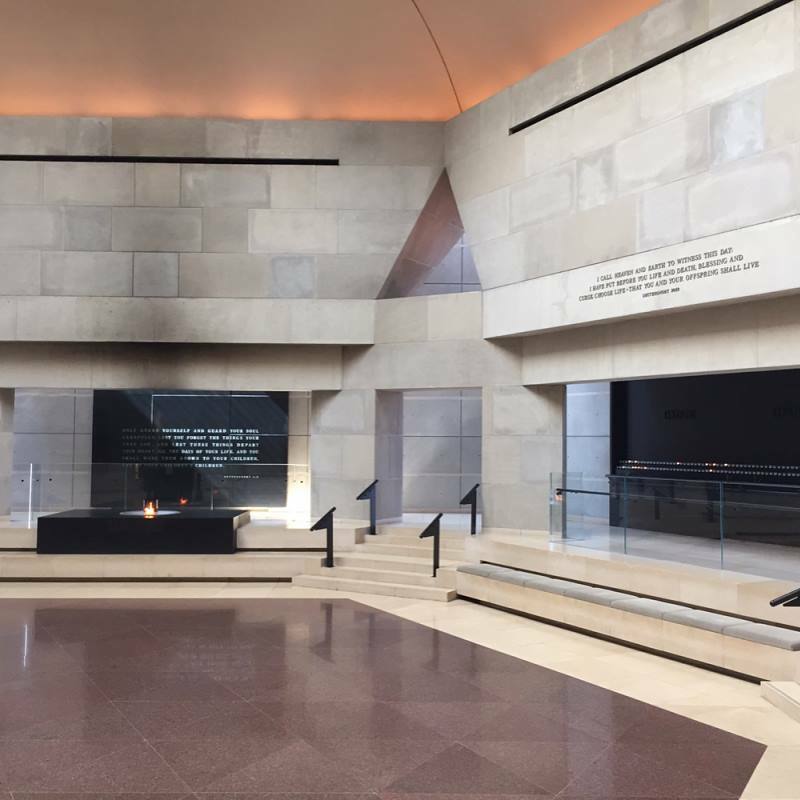 You gave a vivid, powerful narrative of this museum and what it means. Fortunately, there are the Corrie ten Booms who shine forth to bring hope and love in the midst of this horrific portion of history.